Is Gen Z Truly a “Liberal Tsunami”? 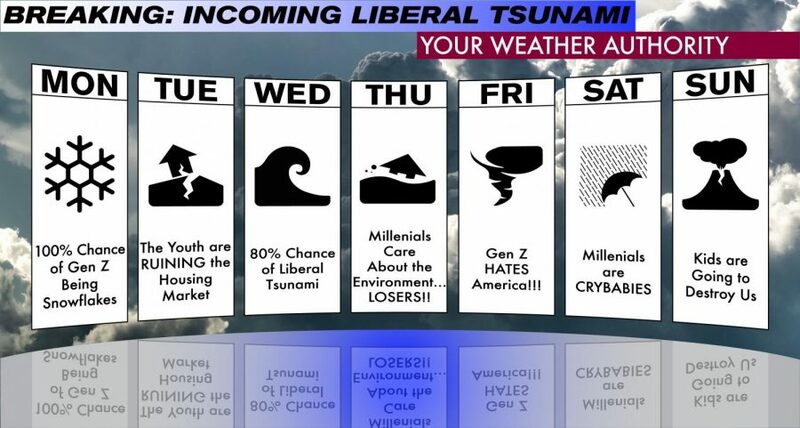 It was a normal Tuesday night; I was innocently scrolling through my emails when one caught my eye: “Generation Z Is a Liberal Tsunami,” a scathing report laid out by Commentary magazine writer Abe Greenwald. I opened the article, immediately feeling the urgency and panic of this conservative old white man radiate from my phone. A strong start surely intended to start a riot in the senior center common room. I could not help but remember that the American Psychology Association affirms that gender is a fluid concept, nor could I find it in me to apologize for my generation’s desire to respect people who do not fall within the societal boundaries of gender. It’s common knowledge among our elders that letting people die because our healthcare system is a mess, having no mandated paid maternity leave and needing to pay more than $200,000 for a college education really does make the United States the best country in the world. How dare we contradict them? It only takes one look at the total lack of police brutality and discriminatory headlines we see everyday if you need to be convinced that African Americans have no lingering difficulties from over 300 years of oppression. It’s ridiculous to say that African Americans need more inclusion in the workforce, education and media when movies like “Green Book” can win an Oscar. Crazy kids, not supporting the interest group that staunchly defends us with their constant attempts to make guns more accessible to unqualified people and believes that having a weapon specifically made for war is a constitutional right. Attempting to analyze our unusual behavior, Greenwald can almost decipher the enigma that is Gen Z, but not quite. These statistics and facts are supposed to serve as proof as to why Gen Z is dangerous. But look, Gen Xers, millennials and baby boomers: I know that new ideas — that not everyone is a man or woman, that institutional racism still exists and children being shot in schools is normal — strikes fear into your heart. But we owe it to ourselves and to future generations to step up to the challenges of modern society. So if you are still afraid … Boo!